Second Inspire 1 remote controller for dual operators to easily control flight and camera functions. Spare Inspire 1 TB47 Intelligent Flight Battery for you to capture more shots. Inspire 1 Battery Heater to ensure safe and reliable flights in low temperatures. Battery Charging Hub to safely and rapidly charge up to four batteries at once. Remote Controller Monitor Hood (for Tablets) to shield your tablets from direct sunlight for a perfect view of your display. Two pairs of 1345T Quick-Release Propellers, including one pair of clockwise replacement propellers and one pair of counter-clockwise replacement propellers. The 1345s Quick Release Propeller is not compatible with the Inspire 1 V2.0. The Inspire 1 V2.0 will receive it's own propeller update soon. 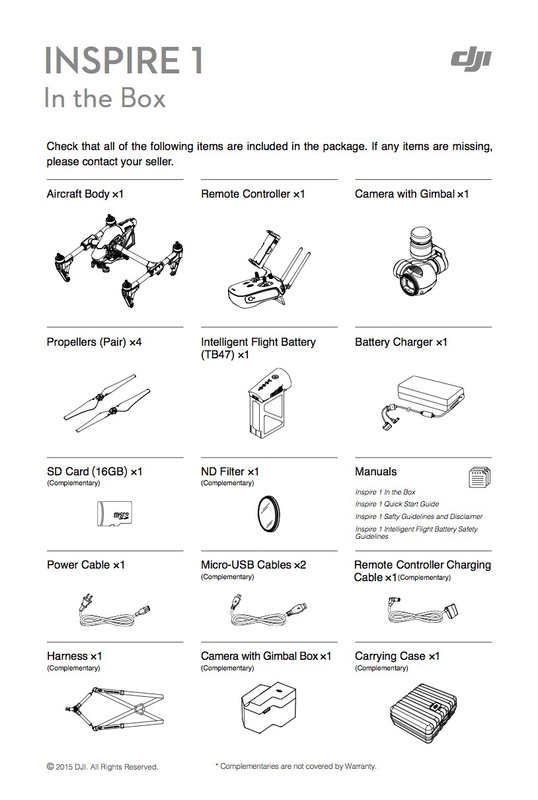 Zenmuse X5 cameras require the "Landing Gear Risers" for use with Inspire 1 V2.0 that is sold separately. This "Landing Gear Risers" will be available soon. DJI INSPIRE 1 PRO (Single..
DJI INSPIRE 1 V2.0 (Singl..
DJI Inspire 1 Pro Black E..